The setting: Melbourne, Australia. Part of a total of 16 world championships are being held this month as a warm-up for the Sydney Olympics. We’re sailing at the far north end of Port Philip Bay, which is about 30 miles across. Anticipated conditions: The sea breeze builds from the south and our racing area is quite shallow (15 feet), so the waves have 30 miles to build and are quite large (locals say the waves stand up and look at you). I’ve trained here a total of 7 days and most days have been 15-20 knots as the sea breeze builds. On two days, it blew 30. Winds shifts are up to 30 degrees (high considering the wind velocity). One factor that has surprised most overseas competitors is the intensity of the sun. It takes as little as 15 minutes to get a burn and the UV index has been “extreme” all week. I got burned right through my clothing on my first day out and decided to purchase special UV clothing for protection. Staying hydrated also is very important. Competition: A record total of 240 entries from 24 countries, with the largest group of 72 being my Masters Division. The person I was very fortunate to beat last time, six-time World Champion Keith Wilkins from the UK, is here and is looking very fast. He has apparently been training hard for a year. There are also a lot of very fast Australians who have home-field advantage. A total of 11 races are scheduled over the next 6 days. Getting a top-5 result will be a lot of work. Training: Three months, focusing on strength training with weights, cardiovascular workouts, and my hiking bench. No meat or alcohol for the last 3 weeks (a real bummer in this part of the world). With a 1:00 PM start, have trained on a large breakfast, no lunch, and two suppers. At 185 pounds, feel in better physical condition than ever. Tapered my training in the last three days. Strategy: Have spent 20 hours this week on the water. People I’ve never met before have all kinds of speed. 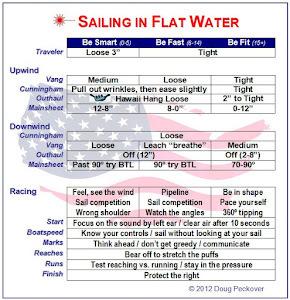 The key will be getting a clean start, upwind grinding in the breeze, and not tipping downwind (the boat is fastest just before it tips and I had lots of trouble getting a feel for the breaking waves this week). Want to be in the top 5-7 at the first mark and have an average finishing position of 4th (40 points over 10 races should win it). Course: Open water, with square waves (square to the wind and square in shape because it’s shallow). Watching the Open Worlds last week, most people played the left-side of the course, although the right paid several times. One theory is left on sunny days and right on cloudy days. Why the detailed notes? I won the Master Worlds in Chile because of many factors, the most important was forcing myself to analyze each race in writing so I could learn from my mistakes. Daily summaries will be sent to my friends and I just don’t want to screw up in front of you all. Racing starts tomorrow… more news then. Day 1 (January 17) increasing wind (10-15 building to 20 knots), 3-4 foot waves, sunny. Race 1 - Good mid-line start that was called back. With a black flag, started in clear air in the bottom third of the line. OK speed. Seemed to be in a fog with a bunch of boats going left with no game plan or lane options, so decided to take 6 sterns to work over to the right. Six time world champion Keith Wilkins from England passed me on starboard 100’ ahead and continued left. Figured I was in the mid-teens. To the right of the fleet, got some breathing room and got into phase with the shifts. At the mark, the boats coming in from the left were headed. Wilkins was 50’ behind me, covered him to the mark. Rounded 2nd behind European runner-up Jaap Mazereeuw from Denmark, with Wilkins 6th. On the reach, Mazereeuw shot off and was 30 seconds ahead of me at the end of the first lap (later learned he’s light and very fast downwind). Wilkins had worked his way into 3rd by aggressively playing the inside and waves on the run. Decided it was more important to cover him than try to go after Mazereeuw, so applied a loose cover on Wilkins protecting the right for tactical reasons. Still ahead of him by 15 seconds at the top mark. On the downwind legs, he caught right up and rounded 5 seconds behind me. We went right, him pointing, me footing and Mazereeuw applying a very loose cover on both of us, which surprised me. As we tacked onto the starboard lay line, I applied a tight cover on Wilkins and Mazereeuw on me. At this stage, we were all less than 10 seconds apart. The breeze was picking up and Mazereeuw started having trouble in the larger waves. I footed out from under him and pulled even. Was trying to decide if I should tack onto port and try to clear him when I noticed that we could all lay the finish line which was unusually long. Decided to foot through the waves. Won by 5 seconds with Mazereeuw 2nd and Wilkins 3rd another 5 seconds back. Was not pleased with this race - this is my first major series since August and the fleet of 70+ boats is my largest in 6 years. I felt very out of sync. Race duration: 75 minutes. Race 2 - Pin favored with no one near it, so sat there and sailed on port with 45 seconds to go. About 20 boats then came charging down the line, leaving me nowhere to join in. Started at the pin in the third row. Prayed for a recall that never came. With the fleet going left, had no option but continue with them as the leaders punched out. Was the last boat to tack onto starboard, way out on the left side. Was just below the port lay line and played a few shifts as much as I could. Approaching the mark from the left, was in about 6th place, mainly due to good grinding speed in clear air. To keep clear air, had actually worked above the port lay line. 200’ from the mark, several boats came up on starboard and I assumed they would tack just below me to make the mark, where I’d get inside room. Wrong move. They continued past the layline and one had to change course to avoid hitting me (after the race, learned that Wilkins was forcing the starboard boats into me - a clever move that I missed). The second major mistake in the same race. Had to do a 720 penalty circles in 15 knots while avoiding the boats that had just rounded the mark and were planing down the waves towards me. Not fun. Rounded about 25th. Went high on the reach, inside on the run, and even on the bottom reach to pull up to 15th. Very few other boats had powered up downwind, which really worked. Stayed with the group just in front and tried to pick them off one by one. On the second beat, almost pulled even with Wilkins who had gone left out of phase. Covered him from behind on a long port tack and he pulled ahead - not by working his body but by steering through the waves really well. He rounded 30 seconds ahead and caught some really good waves downwind. At the end of the second lap, he was 7th and I was 11th. Worked the boat really hard to pass a few more, but unfortunately finished right behind 3 boats - just ran out of time to catch them. Finished 10th with Wilkins 5th. Race duration: 70 minutes. The biggest mistake in sailing is a bad start. Just below that is a major foul at the first mark. I did both in the same race. In Chile, sailed for 6 days without a serious error and I’ve made two in the first day - an incredible waste of hard-earned boat speed. In Dallas, we train with 3-5 boats. Having 70+ boats on the starting line and 240 boats in the area is unfamiliar territory - almost seems surreal. Started at the pin, where there are zero tactical options. In a fleet this size, this is a low-percentage move that I will not try again. Was not nearly aggressive enough - seemed to be waiting for things to happen. The gut feeling to go right in the first race paid off. It was more positional than wind conditions. Or maybe good luck. Boat speed was good - was not passed all day. Wilkins, however, seemed faster both upwind and downwind at times. Conditioning was good after two tough races. In 5th place with a long way to go. Am planning conservative starts in the middle of the line, going left with the fleet and looking for a clear lane coming back to the mark. Believe that Wilkins, who is in 3rd place, is the one to beat. Day 2 (January 18) increasing wind (10-15 building to 25 knots), 3-4 foot waves, cloudy. Race 3 - Well-timed and positioned start in the middle of the line with Wilkins 3 boats up from me. We both punched out, with me slightly ahead. After a few minutes, we sailed into a header and tacked. At one stage, I was almost directly to windward of him. The wind dropped and it became very difficult to not slam into the waves. Wilkins footed into the clear. I put on some vang and tried to foot as well, but he tacked and would have crossed 30 feet in front. Tacked below him to go left and he continued to gain. Just before he blanketed me, I tacked onto port and we approached the mark on a slight lift, which stretched his lead. Wilkins rounded 10 seconds ahead. On the run, he shot off on some good waves. I almost caught up on the run, but he shot off again on the bottom reach. Then disaster (for him). He was yellow-flagged by the jury for pumping more than once on a wave. By the time he had done his 720 penalty turns, he was back in 4th and I had the unexpected lead. On the next beat, worked clear of the lead pack and had a 15 second lead over the next 3 boats. We were in phase, so when I tacked, they followed, except for the last shift, which they ignored. I approached the windward mark from the right and they approached from the left and, sure enough, they got a big lift that reduced my lead to 5 seconds. On the reach, they caught up with Wilkins leading. On the run, Wilkins punched out from the group and rounded right behind me. I went high on the bottom reach to defend and Wilkins caught a large wave and surfed below me far enough to get through me lee, rounding 2 seconds on front. Absolutely beautifully done. I was on his hip and was forced to put in two quick tacks. He continued to go right while I pointed higher and got a nice inside lift that he did not see. When he tacked onto port, I was 50’ in front with Olympic gold medalist Peter Sundelin from Sweden a close 3rd. They split tacks and converged, with Wilkins lee bowing to keep slightly in front. Put a tight cover on Wilkins to try to hold him back as Sundelin tacked away. As we approached the finish line, the committee boat end was heavily favored, so I headed for the pin end hoping that Wilkins would follow. Sundelin headed for the boat end and, for a few precious seconds, Wilkins followed me and then tacked. Final positions: me 1st, Sundelin 2nd, Wilkins 3rd. Race duration: a very long 70 minutes. Race 4 - Was determined to get another good start in the middle of the line. With 20 seconds to go, a boat came reaching down the line and started directly in front, boxing me in between 2 other boats. Waited for the general recall that never came - another disastrous start. Wanted to go right but there was no space, so continued for several minutes gasping for air. When a lane opened up, tacked but was forced left again in bad air. Figured I was in the thirty’s. Wilkins was ahead below me in clean air. Eventually got a slight lane and worked over to the port lay line as Wilkins approached up the middle. In clean air, I rounded about 15th. In bad air, Wilkins rounded about 25th. On the reach, run and reach, did all I could to stay in clean air and started the second windward leg in 12th. Worked the shifts in the increasing breeze and rounded the top mark in 11th. Felt slow in the reach and was passed by several boats on the run who had gone inside. Lost two more on the bottom reach and felt very slow. On the final beat, the wind picked up to 25 knots with large waves. Picked lanes below the pack in front and tried to stay in phase. Half way up the beat, they continued to go left ignoring a 10 degree shift to the left, which I took. As we converged on the finishing line, had worked up to 7th place, finishing just ahead of several boats who were definitely faster in the strong conditions. Wilkins also played the right and finished about 10th. Race duration: 70 minutes. In the first race, did not cover boats behind me and threw away my lead. Another meltdown on the starting line. With clear air, I’ve got two bullets. With dirty air, I’ve been scrambling to be in the top 10. At times, felt slow going downwind. Not working the downwind lanes well. Good speed in winds up to 15 knots. Good tactics when not in react mode searching for a clear lane. The wind phasing and compass worked well all day. There is a virtual 4-way tie for the lead between Wilkins, Sundelin, Jack Schlachter (a very fast Australian who finished 5th in the last world championships), and myself. Still a long way to go. Day 3 (January 19) strong wind (20 building to 30 knots), 7 foot waves, cloudy. Race 5 - Good start in clear air towards the pin, went all the way left with the fleet. On the port layline, there were 5 other boats below and ahead of me. Just did not have the same wave technique these other boats have. 6th at the first mark. Decided not to power-up for the downwind legs which was a mistake. Passed by several boats on the upper and lower reaches who caught waves I could not. Caught some of them on the next beat and reach. On the next run, was passed by two boats that had gone inside for clear air and caught really big waves. Held even on the bottom reach and caught the two back again playing shifts on the final beat. Went for the un-favored end of the finish line and was beaten by 2 seconds by Schlachter of Australia. Finished a disappointing 7th. There are several people with better speed in a breeze. Race duration: 75 minutes. Race 6 - Another good start in the same position in clean air with the same results. By the time we got to the first mark, it was really howling. Rounded about 7th. Hung on for dear life downwind with big waves and passed Wilkins who had tipped. On the second beat, played the shifts and got a really good lift on the port lay line to round a close 4th. The boat in front had problems bearing off from the mark and I caught a monster breaking wave to pass him to lee to move into 3rd. But not for long. A few seconds later on another wave, could not let out the boom in a gust and tipped. Got the boat up again in 5th. On the run, conditions were, for me, out of control. Tipped a second time on another big wave. By the time things were sorted out, was in 12th place. Worked a few minor shifts on the final beat to finish 10th. Race duration: 70 minutes. We get good winds in Dallas, but 2 foot waves are hard to find. I’m obviously paying the price for not practicing in big breaking waves. 4 of the 6 races have been in windy conditions (in Chile, only 2 of the 11 races were in these conditions). Misread the finish line and lost 1 place in race 5. Tipping two times moved me back 9 places in race 6. There is still a virtual 4-way tie for the lead between two Australians, the Brit, and the Swede. I’m in 5th place again, 10 points back. Losing 10 points from mistakes made it a very expensive day. Three more days to go, with windy conditions forecast. Day 4 (January 20) strong wind (25 building to 30 knots), 7 foot waves, cloudy. Race 7 - This race was a carbon-copy of the previous race. Another good start, charged off to the left, rounded 5th, just ahead of Tim Alexander of Australia who has the best upwind speed. On the reach, he passed me to lee and on the run, I tipped again. Knew at that moment it would be a very expensive mistake. At the bottom of the run, another boat just in front tipped and I had to bear off on a screaming plane to avoid getting gored by its dagger board - missed by less than a foot. Rounded about 14th. The boats just ahead stayed in a pack and I was able to pick off a few on the next two beats. Finished 9th. Wilkins 1st, Sundelin of Sweden 2nd, Alexander 3rd. Race duration: 75 minutes (only one race scheduled today, although the race committee said that they would not have run another race in these conditions). Seem to have worked out the starting problems. Think I’ve solved the problem tipping. People who have been letting off their downhaul have had trouble getting it back on for the windward legs. Their sails look terrible. I made the decision to not let mine off to power-up because we are already overpowered. After the race, I was talking with an Aussie about tipping and the first thing he said was “How tight was your downhaul?” He went on to explain about open leaches on the run, etc., etc. which I did not understand. What I do understand is that I’m the only one not letting it off and my boat is the least stable on the runs. Will give it a shot. Wilkins leads, although he is still a virtual tie with two Australians and the Swede. I’m still in 5th place, now 16 points back. A lot of people at the back of the fleet (in the 60’s and 70’s) are getting frustrated with the conditions. Four more races to go. Would really like to move up. Our oldest competitor, Hector Romero from Argentina, got into trouble and was forced to abandon his boat by one of the rescue teams. On the way in, they hit a large wave and Hector became airborne and slammed back down again. His leg was so badly broken that it came through the skin. People here are really upset and are reminded of the world championships in 1994 when one of our fellow competitors from Taiwan drowned. I hope no one else gets hurt. Day 5 (January 21) lighter winds at last! (8-12 building to 18 knots), 1-2 foot waves, sunny - just like Dallas. Race 8 - Good start mid-fleet with lots of room below, everyone going left in the light breeze. The boat above me was in the final stage of rolling me when he was flagged for pumping - guess that’s why he was moving so quickly. Boats down below punched out but only one could cross by the port lay line. A few that played the middle came in looking good. Wilkins and I played a few small shifts near the port lay line. Wilkins rounded 3rd, I rounded 5th. Moved into 4th on room at the bottom of the run. The dying wind started to clock right, so the bottom reach was tight and the next beat was mainly starboard tack. Wilkins was directly in front, pointing higher. Had to put in a few tacks to stay with him but he worked 100’ to windward - my setup was correct but the boat just did not feel right. The course was shortened at the end of the second beat, caught a boat right at the finish line. Ted Moore 1st, Wilkins 2nd, me 3rd. Race duration: 55 minutes. Race 9 - The sea breeze kicked in and we sailed the second race in a beautiful 15 knot southerly. Started mid-fleet, again with lots of elbow room - avoiding the crowd has been much easier for some reason. The Swede won the start at the pin and tacked when the fleet was headed. After he crossed, Ted Moore, USA, on my hip asked me to cross, which I did after waiting for a break in the waves and making sure I could clear all other boats. The rest of the fleet tacked shortly after and went right. The Swede punched out below and was looking very good, with Wilkins and the leading Aussies on my hip. After 5 minutes, we were headed and tacked back onto starboard. At the first mark, it was the Swede in 1st with me 5 seconds back. The waves were just big enough to catch and surf. Positions remained unchanged until the bottom reach, when the Swede was yellow-flagged for excessive pumping on a wave. Because this was his second infraction, he had to retire from the race (he was really pissed). As with race 3 when Wilkins was flagged, had the unexpected lead and was able to stretch it to 30 seconds by the bottom mark. Went right with the others following, then played a few shifts, everyone in phase. At the top mark, led by 45 seconds. On the reach, run, and reach, there were jury boats everywhere and I did not move once for fear of being yellow-flagged. The wind picked up on the final beat, and covered Wilkins and Tim Alexander from Australia to the finish. Won by 40 seconds, Alexander 2nd, Wilkins 3rd. Race duration: 65 minutes. In the lighter breeze, my pointing and boat speed are usually good. For some reason, could not find either on the second beat of the first race. Feel I should have caught and passed Wilkins in these conditions. If I don’t get a lousy start, get pounded by the waves, or tip, my finishes are 1, 1, 1, 3. If I do, my finishes are 7, 8, 9, 10, 10. Seems pretty clear what’s working. Have moved into 4th, two points behind the Swede and 7 points behind Tim Alexander. Wilkins has a good lead. Two more races to go. Day 6 (January 22) shifty (15 dropping to 5), 1 foot waves, cloudy - just like Dallas. Race 10 - For the first time, the wind is from the north, blowing through the city and onto the race area. Started near the pin with a good line sight in clean air. Most of the fleet went left. After about 5 minutes, tacked and took a few sterns trying to keep in the middle of the course in the gusty and shifty conditions. Split tacks with Barry Waller, AUS, who said I was going the wrong way. Was above a large group from the middle that was being lifted. Then they tacked, decided to stay in the lane below and tacked onto starboard. Not looking good. Stayed in phase with the group, protecting the left. Approached the first mark on port with about 20 boats below and ahead. At the mark, got a slight lift with pressure and jammed in front of Schlachter. Rounded 4th, could have been 24th. The Swede leading, Wilkins 10 back. Rolled by Schlachter who was in 5th overall 7 points behind me, got another at the next mark. At the bottom mark, fell asleep and let another boat get inside room. On the next beat, played the shifts protecting the left which felt better. Sailing in the choppy conditions felt just like Dallas and keeping the boat moving was really important. At the windward mark, rounded 2nd behind the Swede. At the end of the reach, he rounded the mark in a puff and took off in the run with a 200 yard lead. I caught him at the end of it and stretched my lead a bit. On the next beat, covered the boats behind, giving up a little to stay in position. Finished 2nd, 30 seconds behind the Swede. Wilkins climbed up to 5th. Race duration: 70 minutes. Race 11 - Wilkins had won the event and did not have to sail the last race. I was now in 3rd, 3 points behind the Swede. He’s an Olympic gold medalist and I really wanted to beat him. A last-minute shift made the committee boat end of the line favored, where 30 boats wanted to start, with another 20 just below. Approached on port and noticed a hole between the two being created by the Swede. Took it and started in 12 knots with clear air, him on my hip. He pointed higher, I footed in the chop. The fleet was headed slightly and I went into pointing mode to work directly in front of the Swede, who tacked. I waited for the header to materialize and then tacked to cover. Conditions were shifty and gusty, so tried to sail by ‘connecting the dots’ (dark areas on the water). A few boats that played the right came in ahead, rounded 4th with the Swede in 8th. Positions unchanged on the reach, went inside on the run. Almost got two more at the end of the run but missed the last wave. Rounded the bottom mark still in 4th. The northerly wind was dying as the southerly seabreeze started to come in, so the conditions were light and choppy. Protected the left and footed with some vang to keep the boat moving. Rounded the windward mark in 3rd. The dying breeze shifted right, so we were now on a run, with others catching up. Stayed high to work right behind the leaders, and then went low with 3 boats to my right and 1 on my left. Managed to squeeze through, and then headed up in a slight puff to consolidate. In a shortened course at the next mark, finished 1st with the Swede 6th. When I asked Keith Wilkins where he finished, he said ‘in the teens’, so he used his previous worst race, a 10th. Race duration: 65 minutes. Lots of little mistakes playing the shifts, but so did everyone else. Good speed upwind when needed. Felt just like sailing on Dallas lakes. There was some confusion about the finish of the last race, so I checked with the race committee and was told that the race would stand. Felt really good about finishing 2nd, 3 points behind Wilkins. After a shower at the hotel, went back to the club to learn that the last race was abandoned and would not count. Apparently, the race committee could not account for 13 boats that had finished but were unrecorded. I talked with the jury and they said that they were permitted to abandon the race even after it was completed. Several others filed a protest, which was disallowed. Final results: Keith Wilkins wins his 7th world championship, Peter Sundelin from Sweden second, me third, Jack Schlachter from Australia fourth, Tim Alexander from Australia fifth. Except for the race management at the end of the last race, it was a beautifully run and exceptionally competitive event. In Chile, I was really tense. In Melbourne, I was really loose - almost too loose. It took me two days to get into the killer mode required. Training for the series was good - was not nearly as tired in the evening as in Chile. Did 3 months of weights for strength (using the muscle-failure technique), hiking bench every second night (got up to 30 minutes without holding onto anything), and cardiovascular (climbing stairs at work). Hurt not being able to do much sailing with my Dallas buddies (too cold). The boats were good and competitive with the local boats used by the Aussies. The US top sections flown in were terrible (bent very easily) and were not permitted in the series. Took off the mainsheet cleats - have never used them. 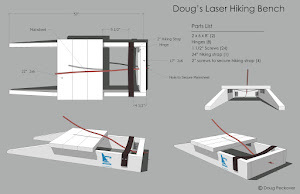 Use the mainsheet for feedback and/or hiking. Cleats also get in the way in light air. Bought an English sail ($740A!) which looked good. Did not see any US sails in the top 10, but then was the only North American in the top 10. Did not see any altered foils, like we see in NA. We were not permitted to touch the charter foils, but there were over 100 private boats as well. It took several days to get the starts in the big fleet correct. It was a combination of avoiding crowds at each end, having a reliable line site behind and up to the line, and keeping all options open until the very end. This was helped by practicing counting to 60 in my head until I was within 1 second of an actual minute. In the last minute, only had to glance at the time to verify my mental countdown - helped keep my head out of the boat. The lines were mainly square, so the main goal was clear air. The attrition rate in the first minute for those without clean air must have been at least one boat per second. Learned that a bad start at the pin is much worse than a bad start in the middle of the line. Lanes were very hard to find. Watches: at the World Master Games last summer, I had a bad start because I bumped my watch and it stopped. For the fist time, tried sailing with two watches - one set at 0:00 and the backup set at 0:02. The first I’d start at the gun and the other 2 seconds later. Sure enough, I had to use the backup for one of the starts. Heavy air: the top Aussies had better speed. Alexander did it by super-vanging and sheeting out and footing, Schlachter was extremely fast (even in flat water on the last day) by shifting his weight slowly forward and backwards (looked like the boat was glued to the water). At times, he had 1/8 of a knot on the entire fleet. There’s still a lot of untapped speed in these boats! Body movement in heavy air: did all I could to prevent slamming down after climbing a wave. Lots of other techniques, mine was not the fastest. Light air: had no real speed advantage over the top boats, gained most when conditions changed and people had to change gears. Did not see any radical movement or roll-tacking. The fleet was clean. Chartered a southern hemisphere Silva compass for $50A (new, they cost a surprising $500A). Upwind in the seabreeze provided no landmarks, so the compass was really important. The top reach was too tight, so catching waves was hard - was probably the slowest in the top 10. The bottom reach was better for catching waves, so no one had a distinct advantage. 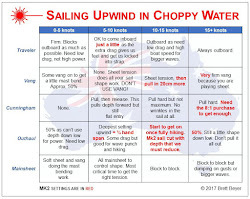 The notes from one of my practice days included “Practiced downwind, jibing, etc. Tipped a lot and feel like I was losing my confidence.” Made the fatal mistake of practicing what I was good at and not what I was bad at. Tipping cost me the series. The Aussies trained very hard for the series. I felt they would get 6 of the top 10 places. In fact, they got 7, but could not crack the top 3. The Race Committee’s mistakes in the final race were unfortunate. It affected positions 2 through 5. If I had 3 fewer points in the series, it would have affected who won the world championship and would have been very, very messy. Felt a slight crease in the middle of my Black Diamond extension tiller but did not think anything of it. It snapped in two at that point without warning during one of the beats. Like to sail on an empty stomach - makes me feel more alert. Ate a large breakfast and then carbo-loaded with two suppers in the evening. In spite of this, started the series weighing 185 and ended it weighing 178. Scheidt and Bourke have won the Open Worlds 3 times. 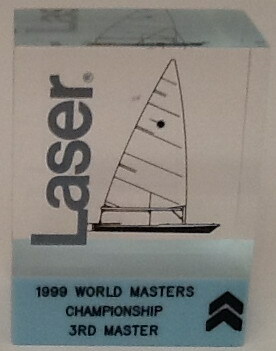 Keith Wilkins has won the Master Worlds 6 out of 7 times. He’s probably the best person I have ever competed against - very fast in all conditions, very cool, very calm, hard to phase. His finish of 3rd in Chile behind me and Mark Bethwaite (AUS) represents the only time he’s been beaten in world competition. Quite a guy.